What is a dog doormat? Why do I need a doormat for dogs? Will a dog doormat stop muddy paws from getting in the house? What material is best for a dog doormat? Best dog doormat for muddy & wet paws? First impressions are everything, and this applies also when someone walks into your home for the first time. Pets have the involuntary habit of dragging dirt inside after outings and adventures, and they often leave a muddy pawprint here and there. This can be avoided with a nice-looking no-more-dirty dog mat since these will keep dirt at the door while also looking great and inviting for anyone who comes to the house. 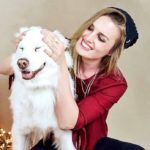 To find the best dog mat, you will want to have a look at a few different options, and when you do, it is good to know what you should be looking for. The market is full of absorbent doormats for dogs and knowing what to keep an eye out for makes the process both easier and more fun. 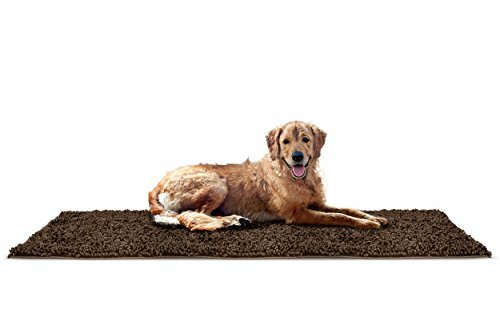 With a dog doormat like this super absorbent microfiber product, you will be keeping the dirt out, while making every dog lover feel welcome into your home. You can get it in medium, large or extra-large, depending on where you plan to place it and what you hope to use it for, and you have the choice of 5 different colors. The non-skid backing keeps it in place – preventing it from sliding around or from someone accidentally slipping on it, and it is the ideal item to stop mud from being dragged into the house. 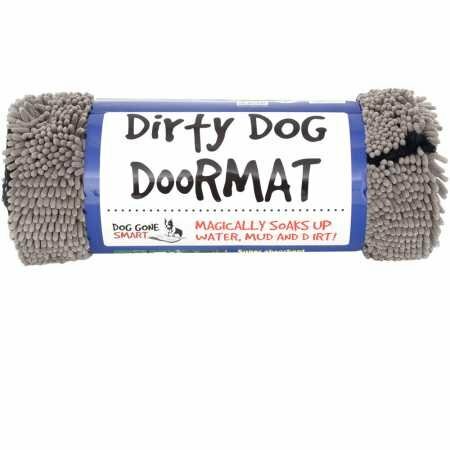 Why We Like It – A dirty dog doormat is a lot better than a house full of muddy pawprints, and this cute microfiber dog mat welcomes you inside with a charming silhouette of a happy pup. This dog paw mat is the only product to use the so-called ‘Gripper non-skid’, which guarantees that it stays safely in its place. 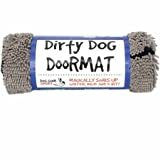 A slippery doormat can cause accidents, or just annoyance as it constantly moves here and there, something that will not be an issue with this doormat for dogs that tend to get a bit dirty from time to time. The microfiber technology works to efficiently trap dirt, water, dog hair, and mud, and it is soft and gentle on those small doggy paws. It is one of the best dirt trapping doormat options available, and you are likely to get compliments from guests that come over for such a cute and welcoming detail. Why We Like It – Thanks to the durable material, these dog doormats can hold a large amount of water and dirt – preventing it from leaking out on the floor – which is ideal when coming inside after a walk on a rainy day, or as something to step out on after a bath. With this Dog Gone Smart Dirty Dog Doormat, you have multiple options for where- and how to use it. No mud will get past this bad boy of a dog mud mat, and it absorbs water and dirt at a rate 5 times faster than many of its competitors. You have the option to pick a color that suits the interior décor of your home, and since this is the first thing guests will see if you place it by the front door, you want it to look good while also filling a function. Avoid getting muddy paw prints on your new couch by letting this dog doormat do the dirty deed and be amazed how quickly it tries and how dirt just seems to magically disappear into the noddle-like surface. The dog paw cleaning mat can be shaken off to get rid of dried mud and debris or washed in the washing machine for a more thorough clean. Why We Like It – These dog doormats are discrete in their design and suitable for any home – even for those who don’t wish to announce that it is a dog food cleaner mat. You can choose a color that goes with the colors of the room, thanks to the many variated color options. 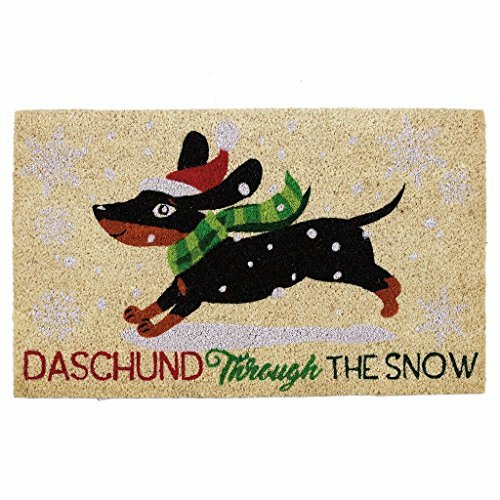 Finding the best doormat for dirt loving pups, or just the best doormat for dogs, in general, gets easy when presented with a quality option such as this one right here. 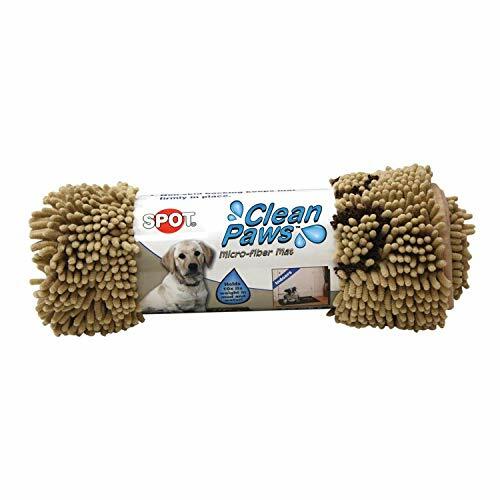 It is a big and jumbo-sized dog paw cleaning doormat, which also can be used for the dog to sleep on, to protect a corner of the couch or for when traveling in the car, and it is big enough to suit even the largest fur pups. It is soft and highly absorbent, and it handles machine wash after machine wash while continuing to look just like it did when you first bought it. Why We Like It – It is great to see a product for very large dogs, and this absorbent dog mat for dogs is big enough for even a Great Dane or a Saint Bernard. The FurHaven water- and dirt trapper mats for dogs are resistant, comfortable to step on (and even for pups to sleep on), gentle on sensitive paws, mud absorbent and stylish enough to fit into any home! 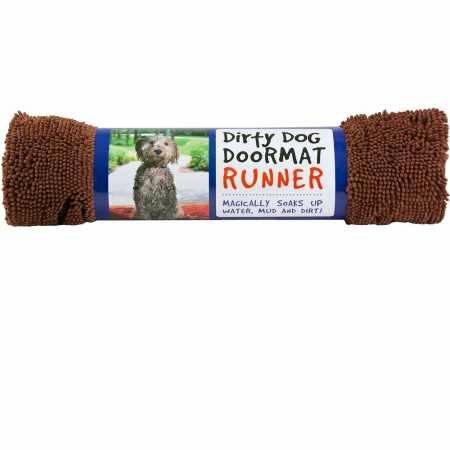 They work great as dog-proof doormats to stop dirt from coming into the house, or you can use them to soak up water after your dog comes out of the shower, after a dip in the pool or when returning home from a wet and rainy walk. You can even take it with you to the beach for your dog to lie on after swimming, or to protect your car seats on the way home. It is a versatile and absorbent rug for dogs, that can be machine washed and dried once it starts getting a little too murky. 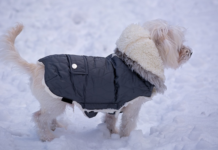 Why We Like It – Not only are these mud mats for dogs affordable in comparison to other similar products, but they are made with durable stitching and tough material that lasts. 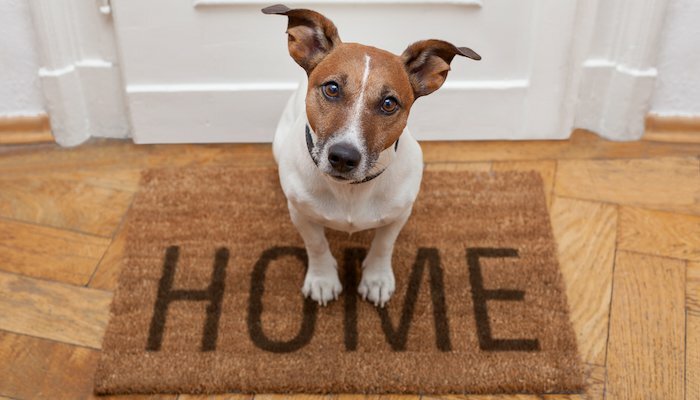 With a phrase that says ‘Home is Where Someone Runs to Greet You’ – it is hard not to love this adorable pet doormat. The top is made with natural coir, which has the ability to trap debris and dirt as you step inside the home. Dry your shoes on it, or have your pup walk across on their way. 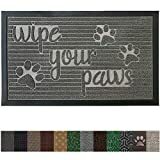 No more muddy pawprints on your floor with this mud mat for dogs, and it will be a great conversation starter for guests that come over to your house. Keep your floors clean with an item that looks great and works even better, and that can be shaken outside after each use to get rid of sand, rocks, and dirt. 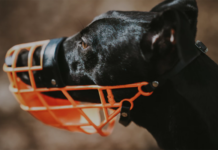 Why We Like It – The material is slightly different than that of many other absorbent dog mats and more focused on trapping dirt and sand than soaking up water. Perfect for the entrance of the house, and easy to keep clean. Imagine coming back from a long walk with your favorite fur friend; it has been raining, and your pup has his or her paws all dirty. You open the door, and there it is! A fancy looking muddy paws mat – not only looking fantastic but also making sure that your home remains spotless (as much as we love our dogs, nobody likes muddy pawprints on their new couches) no matter the weather. Finding the right dog mats that absorb water and mud is not rocket science, but some products might be better than others, and/or have the ability to soak up more moist than some competitors. Look for a product that comes in the size you need. While doors tend to be the same width in most cases, the space you have for a mat might differ. Perhaps your entrance is filled with furniture and other items, or maybe you would like a really large mat that more than just the immediate area in front of the door. If you have a big dog, for example, it does not make much sense to get a tiny mat made for a Chihuahua, since it won’t serve its purpose unless the dog’s four paws will inevitably have to walk across the mat when coming inside. Size matters, when you buy a doggy doormat, so make sure you check the size specifications before deciding. 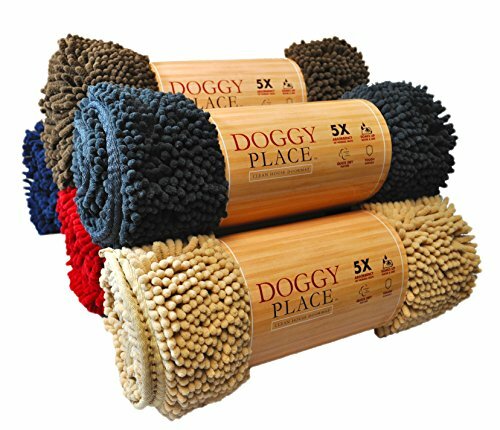 You can place your pup mat inside your house, right on the other side of the door as you come in, you can have it on the outside so that you have to walk across it to even get to the door, or you can get two doggy doormats and how one on each side. If you want to have a mat outside, then it is important to pick a product that can resist the elements, and a harder material might be to recommend for outdoor use. These materials won’t get soaked if it rains and will continue to work their magic even on days when the weather conditions aren’t great. You can get the best doggy doormats there are, but unless you take care of it, it won’t last as long as it could have otherwise. 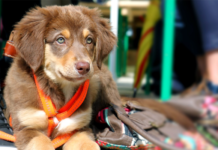 Regardless of size, material, print or brand, a doormat for dogs needs taking care of, and you want to make sure you shake it outside a few times a week, to let loose dirt, sand, and debris fall off. You can also opt for rinsing it off with a hose once a week or wash it in the washing machine if the product is deemed washing machine safe. The better you take care of your dog rug, the longer it will last. A dog- or pet doormat is a small rug you can place by the front door of your home – either on the inside or on the outside – to keep the dog from dragging dirt into the house. It works to soak up water and mud when being walked across, which also makes it beneficial for humans coming and going. By placing quality dog doormats outdoors and indoors, you get a secure barrier between muddy paws and those new couches. The material of pet doormats may vary, but their purpose remains the same – to make sure your home stays as clean as it can be, to save you both time and effort. Owning a dog will always come with some additional cleaning requirements, but good and absorbent rugs for dogs make everything a little easier. When a dog goes out for a walk, they come back home with all the dirt, bacteria and moist that they’ve managed to pick up during their outing, and not everybody thinks twice about cleaning their paws. A dog walking straight in after a walk is equivalent to a person walking straight inside without taking their shoes off, and logic tells us that it will contribute to a dirty floor. A human with shoes, however, don’t usually jump on the couches or on beds, but a dog might, which could result in paw prints all over furniture or in other places where they could be hard to get rid of. With a doormat for dogs feet (and paws) stay cleaner longer, and it also looks great when you walk in or out of the home. No, it does not completely stop those mud paws from leaving stains on the floor (or elsewhere), but it will keep the brought-in dirt to a minimum. You can always keep a can of water next to the door to dip your dog’s paws into, then set them down on the dog mat (which will help absorb the excess water) and dry those paws off with a towel before letting your pup inside. Absorbent rugs for pets are also fine to use on their own, however, for every-day dirt-, sand- and mud prevention. 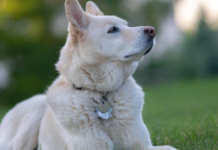 The best absorbent dog mat will be made with materials that absorb water, traps dirt and cleans off mud, which is the same principle used to make doormats for humans. Microfiber is one commonly used material, and most will have PVC rubber or similar covering the back of the mat – to prevent it from slipping around or from someone slipping when stepping on it. 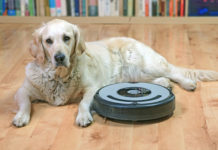 You will want a material that can be cleaned easily, and many doggy doormats are washing machine safe and quick-drying. You might want to consider the ‘Ethical Pet Clean Paws Dog Doormat’ – a stylish and affordable option that comes in various sizes. You can pick one that fits the area you wish to cover and protect, and the color varieties make it easy to find one that fits well into the décor of your home. Placing a doormat for dogs by the door is not just a question of practicality, but also one of style. Show guests that come to your house that you have taken precaution to keep doggy dirt outside, and also that you have a sense of style and a flair for interior design, by choosing a mat that adds something extra to the environment it is used in. There are many different options and finding one that fits your personal taste and the color scheme of your beautiful home shouldn’t be too hard. Dogs can’t help that they get dirty, but we can help them to keep that dirt where it belongs – outside. Check user reviews if you are unsure of what product to get, to see what other buyers have thought of the dog doormat you are considering. Over half the population in the United States own a cat or a dog, and every single one of those pet owners would probably benefit from an absorbing and welcoming doormat.